Here’s a puzzle for you – why would Chase Bank offer a $200 cash bonus for opening a new savings account where you must deposit a minimum of $10,000 and not touch it for 90 days? Our household received such an offer in the mail a few days ago. Here’s the outer envelope – notice the faux check creative approach through the window. Note that the offer was addressed to “Our Neighbor” and not a specific person. This approach enables new movers to take advantage of the offer as well. The one-page letter is brief as you can read below. To make responding easier, the location of the nearest Chase branch appears just after the middle of the letter. I see this offer as a puzzle given that I’ve read several media articles lately telling me that banks and credit unions are swimming in deposits as a result of very low loan demand. Some smaller financial institutions have gone so far as to discourage more deposits. 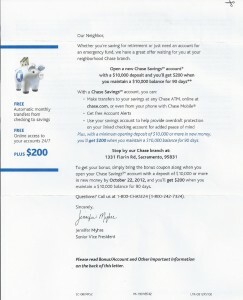 So why would Chase want $10,000 from me and thousands of other people living around this branch? 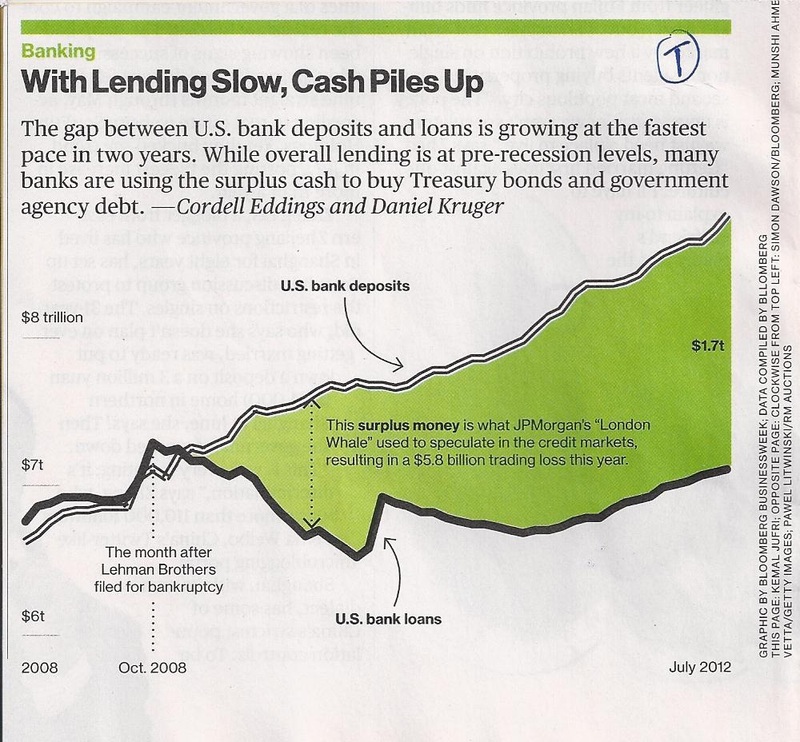 Perhaps the answer can be found in the attached chart appearing on page 36 in the August 27 – September 2 issue of Bloomberg Businessweek. 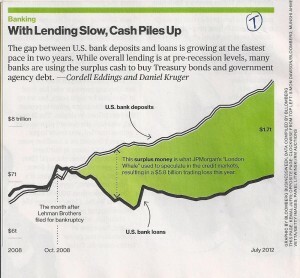 Look carefully at the comment in the green area of the chart – it’s very enlightening. So, one answer to the puzzle could be that the folks at Chase need your savings for speculative purposes. On the other hand, I believe another reason exists for this lucrative savings account offer. Offer prospects a savings account and hope they open a checking account. Now consider this question for which I don’t have a proven answer: Which approach generates the most new accounts – offering a $200 cash bonus for opening a new checking account or $200 for opening a new savings account? An educated guess tells me it would be the savings account offer. It’s much faster and easier to open a new savings account – even if the money is coming from another bank or credit union. Yet, a savings account isn’t of much value without a linked checking account. Perhaps they’ve discovered that it’s easier to get the savings account first and the checking account will follow at some point. They encourage this behavior by mentioning the following three items on the front and back of the direct mail letter shown above. A page of important information and disclosure copy appears on the back of the letter. Sell the savings account up front by offering a $200 cash bonus and subtly sell the value of a companion checking account throughout the copy. If I continue receiving similar savings account offers I’ll know this strategy must work. 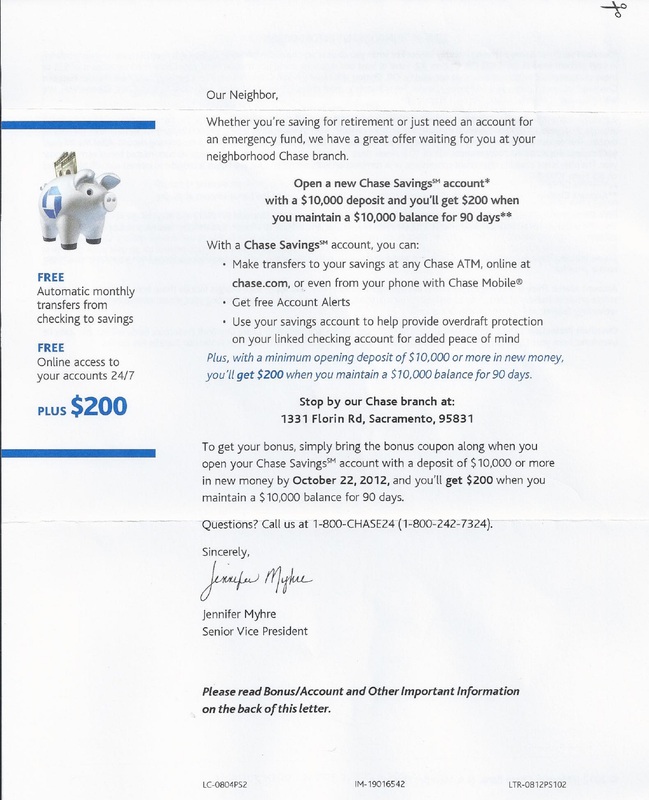 Chase wants the savings deposits for speculative use while hoping to also get the new customers’ checking account down the road. 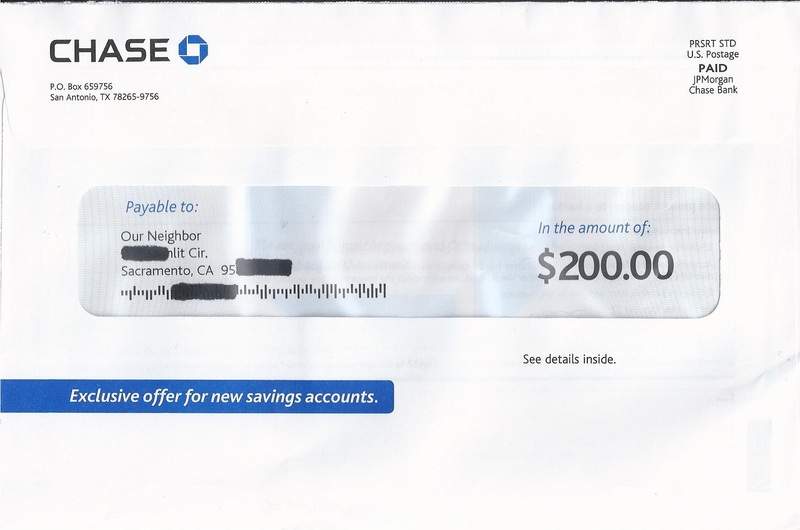 What are your thoughts about Chase’s $200 cash bonus offer for a $10,000 savings account?